“Cell signaling is involved in various kinds of decisions a cell has to make – for example, controlling proliferation, differentiation, migration, survival and apoptosis,” says Carl-Henrik Heldin of the Department of Medical Biochemistry and Microbiology at Uppsala University, Sweden. But signaling pathways are often deregulated in cancer, leading to the adoption of abnormal cell behaviors. “A cancer cell loses control over its growth – so it grows when it shouldn’t, it doesn’t die – and it migrates and invades its environment,” says Heldin. Studying how cell signaling can help drive cancer development is opening new opportunities for precision medicine – using biomarkers to identify perturbations in a person’s tumor and then selecting specific treatments that can target them. Targeting pathways that are involved in many tumors offer particularly attractive opportunities. “There has been all this focus on understanding the nitty-gritty of every single tumor and what’s driving it – but actually if you find something that’s really quite broad-hitting, that might be more beneficial,” explains Caroline Hill, Senior Group Leader at the Francis Crick Institute. Transforming growth factor β (TGF-β) and members of its superfamily are involved in many processes in diverse tissues during the stages of development and throughout our lifetimes. “TGF-β acts on essentially all types of cells and it has dramatic effects,” says Heldin. Consistent with its diverse activities in all cell types, deregulation of TGF-β signaling is a feature of many different diseases including autoimmune and cardiovascular diseases, as well as in many cancers. “It is probably involved in most tumors – or certainly in most solid tumors,” says Hill. Looking at the wider TGF-β superfamily, this includes more than 30 members that are involved in various physiological and pathological processes. Although much attention has so far focused on TGF-β ligands in cancer development, deregulated signaling of many others also play crucial roles – including bone morphogenetic proteins (BMPs), growth and differentiation factors (GDFs), activins and nodals. This study describes in vitro measurement of intracellular PPIX formation to elucidate newly developed ALA derivatives of tumor types. It is based on the breakthrough for the photodynamic cancer therapy of the photosensitizer protoporphyrin IX (PPIX). 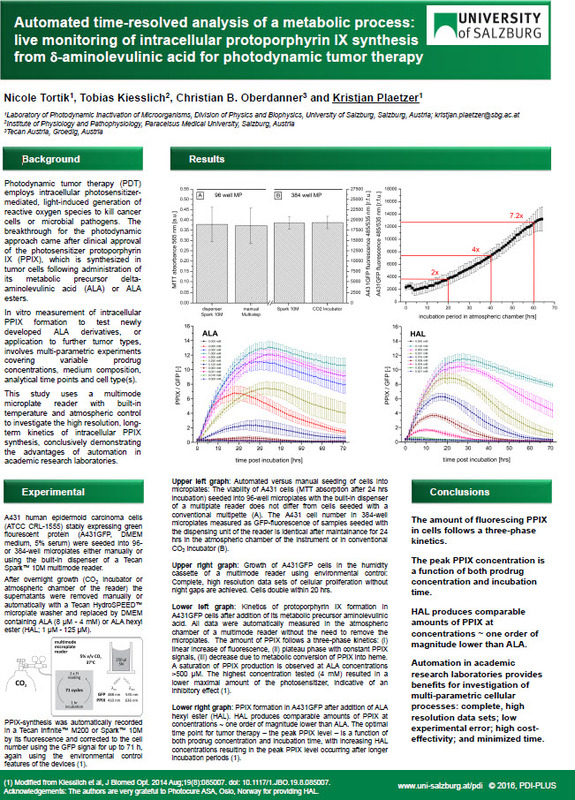 Download this poster to learn how a multimode reader measures intracellular PPIX with high resolution long-term kinetics to increase reproducibility of your data while minimizing experimental error. In normal cells and early-stage cancers, TGF-β signaling suppresses tumor formation by inhibiting cell growth and apoptosis. But cells can become resistant to these anti-growth effects through acquiring mutations – either in genes within the TGF-β pathway itself, or in some of its target genes – and start growing out of control. Particularly in advanced cancers, TGF-β signaling acquires a range of tumor-promoting effects, which include a change in the differentiation of epithelial cells to make them more mesenchymal. “In turn, this makes the cancer cells more invasive and more prone to form metastases,” says Heldin. As well as direct effects on tumor cells, TGF-β signaling can also promote cancer growth through effects on other cells within the microenvironment. For instance, it can suppress immune cell function; stimulate angiogenesis or cancer-associated fibroblast development. It is hoped that studying the molecular mechanisms involved in TGF-β superfamily signal transduction will uncover ways of inhibiting overactive pathways or upregulating protective pathways suppressed in cancer development. “We try to learn how TGF-β signaling pathways are controlled – how they are initiated and how they are shut off – and then try to link them to the various tumor-suppressive and tumor-promoting effects,” explains Heldin. Studying TGF-β signaling in cancer relies heavily on the use of laboratory models. For example, the use of CRISPR-Cas9 gene editing technologies is enabling researchers to study the effects of different mutations. Much can also be gleaned from investigating how TGF-β signaling regulates asymmetric cell division and cell fate determination in early embryonic development. “We are looking at the precision of signaling in early development – and then seeing how cells in cancer hijack all the same activities to such a terrible end,” says Hill. Due to their potential for broad application for many different cancers, there are currently many TGF-β signaling inhibitors at different stages of the development pipeline. But caution is necessary, as it is essential that these are designed to selectively inhibit pro-tumorigenic pathways while preserving tumor suppressive pathways. “The problem is that you risk making dormant tumors – or early-stage tumors – worse,” explains Hill. Drug specificity also remains a big challenge. For example, many companies have generated small molecule inhibitors designed to block the activity of TGF-β receptors. But members of this family of receptors are dual-specificity kinases, with structural characteristics that are similar to both serine/threonine and tyrosine kinases. “So you’ve basically only got two main classes of inhibitor – on one branch you’re inhibiting all TGF-β, activin and nodal signaling, and quite a lot of GDFs – and on the other, you’re inhibiting all BMP and some GDF signaling too,” explains Hill. Designing drugs that can target TGF-β superfamily ligands offer alternative options, but this can present different challenges. For instance, there has been a lot of work on TGF-β antibodies but these haven't really worked very well in vivo, mainly because the active form is largely inaccessible as it’s stored as a latent complex. In contrast, the possibility of combining TGF-β therapies with drugs that target other disease mechanisms is a cause for much optimism. For instance, there is a great deal of excitement about using them in combination with immune checkpoint inhibitors. “This is very big in the field right now – it goes back to the idea that TGF-β is having an effect on immune cells in the stroma, not just on the tumor cells themselves,” says Hill. Immune checkpoint inhibitors target proteins that usually suppress immune responses, enabling T cells to kill cancer cells more effectively. In recent years, they have been shown to be effective for several cancer types. But there is huge variability in response between patients and so researchers are looking for ways to widen their benefits. “The idea is if you can get rid of the immune suppressive effects of TGF-β signaling, you will end up with more T cells – and if you can also make those T cells more active, then you should get a bigger response,” says Hill. Last year, Tauriello et al. and Mariathasan et al. both independently demonstrated the potential of this strategy – showing that combining TGF-β signaling blockade with checkpoint inhibition synergistically reduced the growth of metastatic tumors in mice. TGF-β signaling is fundamental for cellular decision-making from embryology through to adulthood and in disease. “Somebody introduced a TGF-β session at a meeting as ‘you all work on TGF-β, some of you just don't know it yet!’” says Hill. Despite the challenges, researchers know that it’s an exciting time to be working in the field – strategies involving the inhibition of TGF-β signaling is close to yielding benefits for patients with cancer. “We have learned quite a lot about the molecular mechanisms and are now in a very dynamic state where this knowledge is now being applied,” says Heldin.